Internally displaced persons in displacement sites in Mogadishu. To strengthen protection services to internally displaced people in the Somali capital, Mogadishu, the Somalia Humanitarian Fund recently released $7 million to scale up life-saving and life sustaining assistance. According to a statement released today the new funding will provide support for education, food security, health, nutrition, protection, shelter, and water and sanitation activities in the Daynille and Kaxda districts near Mogadishu. These two settlements host the majority of the more than 120,000 displaced people. “The internally displaced in Somalia face enormous challenges, and timely and focused humanitarian support is essential to address their urgent needs. Many displaced people who will benefit from this allocation were evicted from settlements in the city centre, where they originally sought refuge,” said the Humanitarian Coordinator for Somalia, Peter de Clercq. The living conditions in these settlements have been described by the UN Office for the Coordination of Humanitarian Affairs (OCHA) as deplorable; services are limited or non-existent and human rights violations are rife. This is the second allocation to assist internally displaced people in Somalia this year. The first allocation of $7 million was released earlier in July for internally displaced people in Baidoa and Kismayo. The statement of the humanitarian coordinator points to clan conflicts, military operations in southern and central Somalia, natural disasters and forced evictions as main drivers causing displacements across Somalia. Currently the country’s capital hosts some 400,000 internally displaced Somalis in over 400 settlements; more than 36 per cent of the estimated 1.1 million people who remain in protracted displacement across the eastern African country. The emergency aid comes from the OCHA-managed Somalia Humanitarian Fund. Contributors to the Fund in 2016 have included Australia, Denmark, Germany, Ireland, the Netherlands, Sweden, Switzerland, and the United Kingdom. 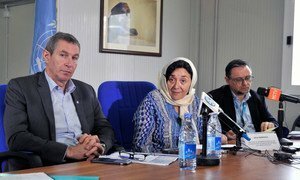 Concluding a six-day visit to Somalia, a United Nations child rights envoy has called for better protection of children caught up in armed conflict, urging the country's authorities to treat former child soldiers as victims in need of protection rather than as criminals.